If you use virtual machines, make sure that all the virtual network adapters are set to the same mode (such as NAT) and that they can ping one another. Turn off any firewalls. The machine most likely to have a firewall on is the Windows 7 machine. SNMP is a UDP-based protocol that is frequently set up in an unsafe manner, allowing attackers to use SNMP servers to amplify DoS attacks. This project demonstrates the attack. Routing and Remote Access snarls up network traffic if it's turned on for this project, so we'll shut it off. In the results, click Services. 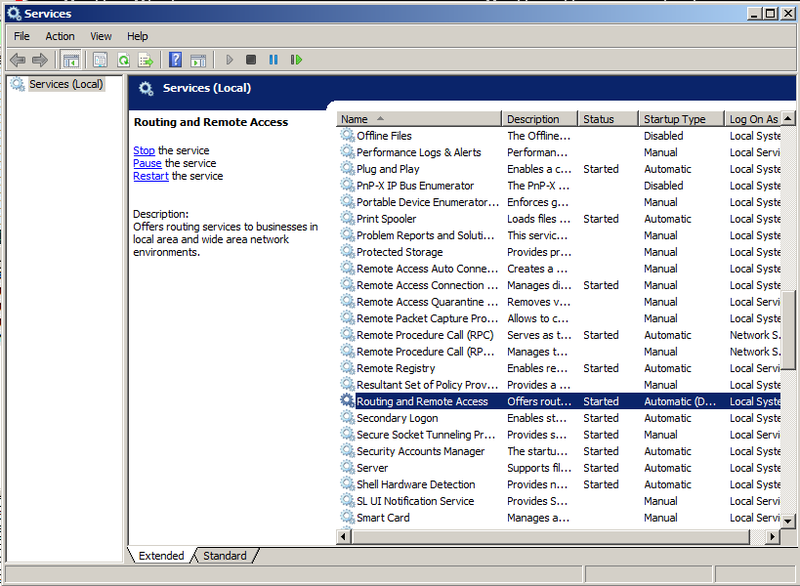 Scroll down to find "Routing and Remote Acess", as shown below. If it is there, click Stop to stop it. If it's not there, that's OK.
Open a Command Prompt and execute the IPCONFIG command to find your Windows Server 2008 machine's IP address. Record it for future use. On your Kali Linux machine, in a Terminal window, execute this command, replacing the IP address with the IP address of your Windows server. You should see many pages of output, as shown below. If you don't see a response, check your networking to make sure the packets are reaching the target. Start Wireshark sniffing on your network adapter. On your Kali Linux machine, in the other Terminal window, execute this command again, replacing the IP address with the IP address of your Windows server. You see a long series of "SNMP getBulkRequest" packets, each followed by an "SNMP get-response", as shown below. 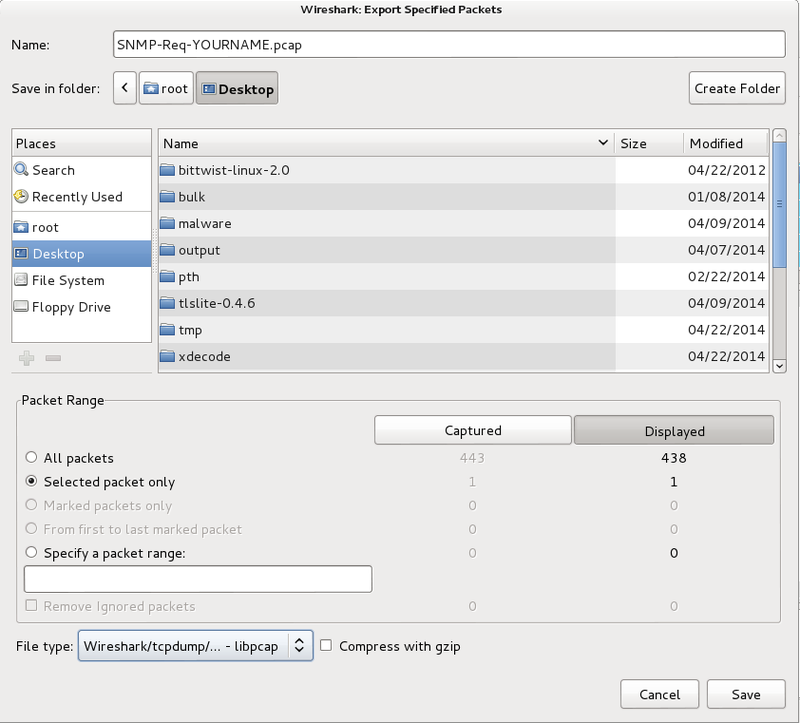 In Wireshark, in the top pane, select one of the SNMP packets. In the middle frame, expand the "Frame" section. Right-click "Frame Length" and click "Apply as Column", as shown below. Now the upper pane of Wireshark shows a column named "Frame length on the wire". Click the "Frame length on the wire" column header to sort by it. Scroll to the bottom to find the largest value. Note its packet number (the "No." column on the left). In the figure below, the largest value was 793 bytes for packet No. 15. In Wireshark, click the No. column header to sort the packets in time order again. Scroll as needed to see the largest packet and the request packet preceding it. In the image below, the request packet was No. 14 (87 bytes) and the response was No. 15 (793 bytes), so the amplification factor is 793/87 = 9.1. Click the "SNMP getBulkRequest" packet that gave the largest response, so it is highlighted in the top pane of Wireshark, as shown below. From the Wireshark menu bar, click File, "Export Specified Packets...". 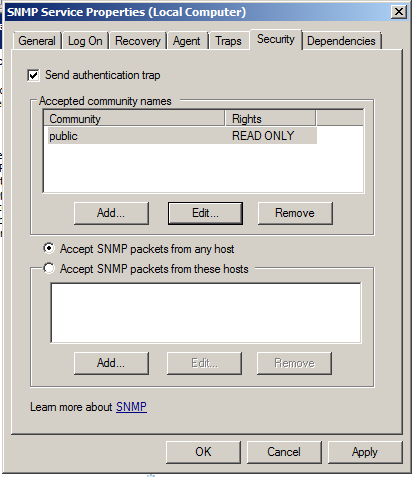 In the "Wireshark: Export Specified Packets" box, at the top, enter a name of "SNMP-Req-YOURNAME.pcap". On the "Save in folder:" line, click Desktop. In the lower left, click the "Selected packet only button. 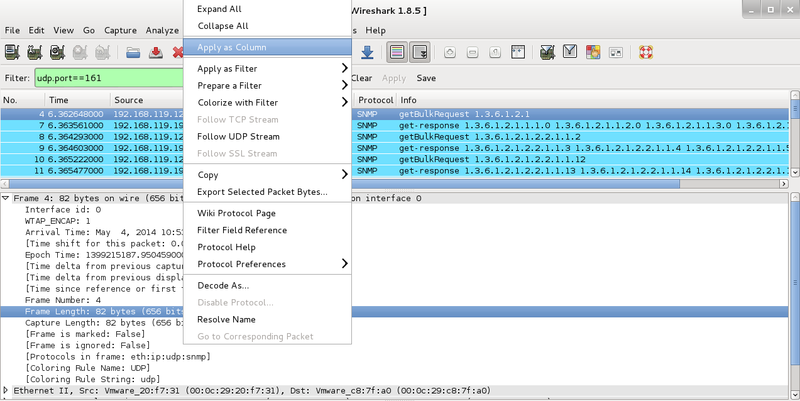 Select a "File type" of "Wireshark/tcpdump/... - libpcap", as shown below. On your Kali Linux machine, close Wireshark. Download the Linux version and save it on your Kali desktop. Note: when I installed libpcap-dev, I got an error processing "xplico" but it seems to be OK to just ignore that. On your Windows 7 target machine, open a Command prompt and execute the IPCONFIG command to find its IP address. Using bittwiste, we will change the source IP address of the SNMP Request packet to the target's IP address. Bittwiste will calculate the correct checksum automatically. When the command succeeds, you should see the message "1 packets (87 bytes) written", as shown below. On your Windows 2008 Server, start Wireshark sniffing. You should see three SNMP requests coming in, and three SNMP responses going out to the Windows 7 target, as shown below. If you have displayed the packet length, you'll see that the responses are much larger than the requests. On your Windows Server 2008 machine, close Wireshark. YOU MUST SUBMIT A FULL-SCREEN IMAGE TO GET FULL CREDIT! On the host machine, not the virtual machine, open Paint and paste in the image. Save the image with the filename "Your Name Proj 5xa". Use your real name, not the literal text "Your Name". This attack has no visible effect on the target, because the SNMP responses are hitting closed ports and the target needs very few resources to process them. This attack is just a UDP flood at present, and if attackers use thousands of SNMP reflectors, that can overwhelm a network. But it makes a dull lab project. To see the effect, we'll configure the Windows 7 machine to listen on port UDP 500, which is the IKE service used for L2TP/IPsec VPNs. 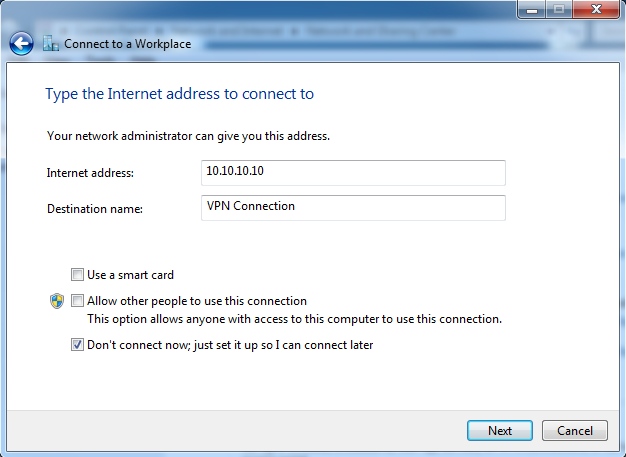 On your Windows 7 target machine, click Start, then "Control Panel", then "Network and Internet", then "Network and Sharing Center". For "Destination name:" accept the default of "VPN Connection". Leave "Password:", "Show characters", "Remember this password" and "Domain optional:" blank. Now click Close. Do NOT click "Connect now". 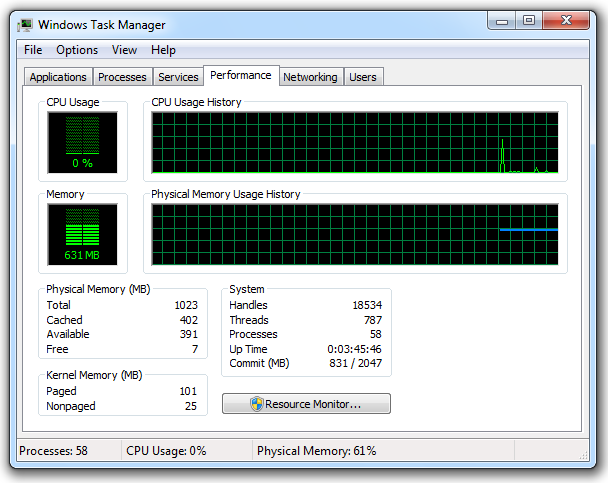 On your Windows 7 target machine, right-click the Taskbar (at the bottom of the desktop) and click "Start Task Manager". Using bittwiste, we will change the source UDP Port of the SNMP Request packet to 500, so it will burden the target more. This sends an endless flood of SNMP requests to the Windows 2008 Server, which reflect and amplify, attacking the Windows 7 target. You should see the CPU increase, as shown below. On one of my test machines, it rose to 50%, but on the one shown below, it only rose to 18%. On your Kali Linux machine, press Ctrl+C to stop the attack. Make sure your screen shows the CPU graph rising from near-zero to some larger sustained value. Save the image with the filename "Your Name Proj 5xb". Use your real name, not the literal text "Your Name". Email the images as attachments to an e-mail message. Send it to: cnit.124@gmail.com with a subject line of "Proj 5x From Your Name", replacing "Your Name" with your own first and last name.